Like the clip-in vs. flat pedal debate, bike trailers are very polarising amongst cyclists. There tends to be the perception that bike trailers add a lot of weight and can be cumbersome to use. While somewhat true – when you match a trailer perfectly to your use, you may find it’s better than using panniers! This article will look at the best bike trailer options for touring… but first, a little intro about bike trailers and trailer design. So Why Use Bike Trailers? Trailers eliminate the need for heavy-duty frames, forks and wheels. 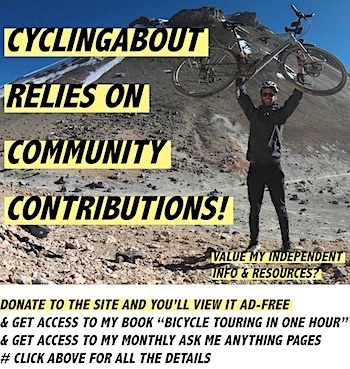 This not only allows you to use lighter weight bikes and components, but permits the use of mountain, road, cyclocross and folding bikes (as touring bikes). If you’re biking and hiking, it can be awkward to carry a decent-sized hiking pack on the bike. Trailers are able to easily cradle large bags. Given the large single storage space of trailers, you can fit long tent poles and other bulky items into trailers. It’s often easier to cart around one bag off the bike rather than the complete suite of panniers. The Sentier Trailer/Trolley (above) even has a retractable handle and trolley wheels built-in! The rear axle is the most common mounting location and is often the quickest for trailer installation and removal. Despite what you may be thinking, trailers put a surprisingly low-stress on bike frames. Got a 12mm rear axle? Check out the Burley Coho XC trailer, the aftermarket axles from The Robert Axle Project for BOB trailers or any of the seatpost mounted trailers. The key advantage of seatpost mounting trailers are that they offer a tighter turning circle as they pivot closer to the front of the bike. 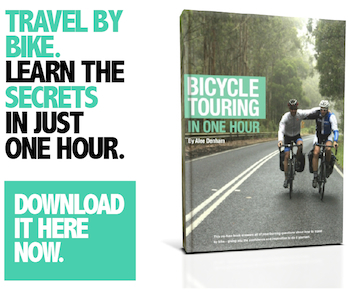 You’ll notice that most bicycle touring trailers listed are single wheel. This is because they are generally narrower, lighter, have a lower rolling resistance, are more manoeuvrable (as they lean with the bike), have one less wheel to puncture and can better avoid potholes. Two wheel trailers tend to be better for around town as they’re easier to load and are more stable at low speeds. Some trailers have been designed to fold into a small package so that you can pack them away into a bike box with your bike. The Aevon KIT L80 folds for plane travel. One of the reasons people avoid trailers is due to their weight. But you may find that the true weight difference is quite negligible. When comparing like-for-like in terms of storage and waterproofing, there’s no doubt that trailers add a bit of weight. But it’s probably not as much as you’d think: it can be as little as +300g over a set of racks and panniers. To put this weight into perspective, I’ve determined that a kilogram is worth no more than a few seconds on a hilly day of bicycle touring. 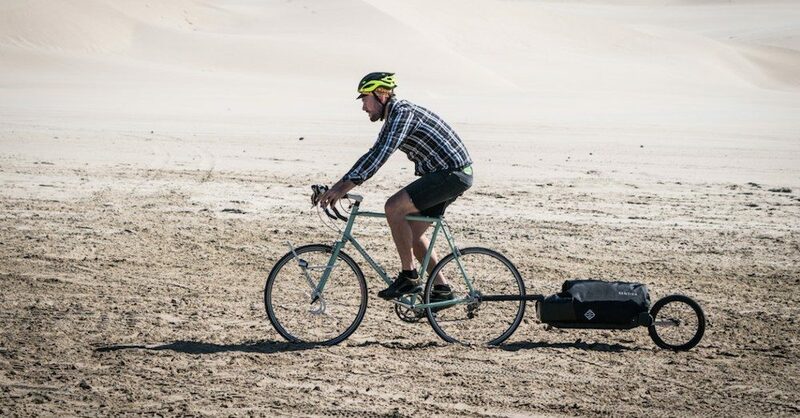 You already lug around enough weight when you’re bicycle touring. I’ve capped the trailer weight to 10kg because the below trailers have an adequate carrying capacity of 30kg+. Almost all of the below trailers have been tested extensively by bicycle tourers around the world. I’m happy to add other options if enough people have firsthand experience with other bike trailers. 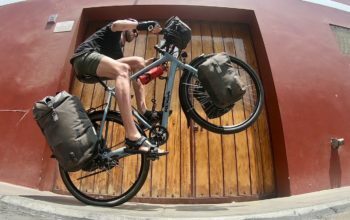 Ok, let’s take a look at the best bike trailers for bicycle touring! 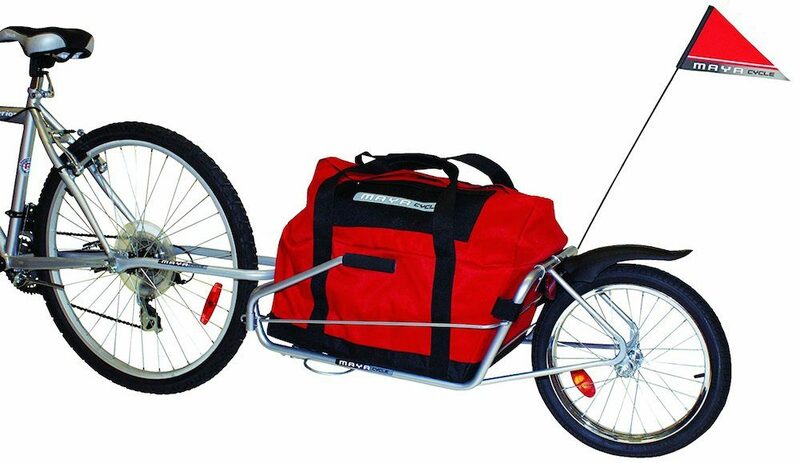 Adventure Outdoor Co. make this single wheel bike trailer which can fold flat for storage or plane travel. The rather affordable CT1 is supplied with a large drybag and flag to get you on the road without fuss. A recommendation by users is that the low-quality rear tyre is replaced for something a bit harder wearing. Aevon KIT L80 bike trailer. 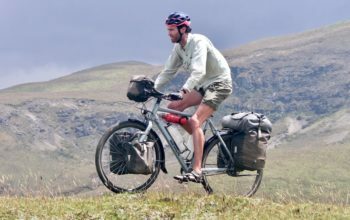 Aevon are well-known in Europe for producing some of the best bike touring trailers. The KIT L80 is their lightweight option which can actually fold quite flat given the lack of frame; great news for those who travel with planes. All of the Aevon trailers use a seatpost mount making them quite manoeuvrable as they pivot from a mid-point on the bike. Up the back is an adjustable air shock to dampen vibrations on rougher surfaces. You can read my review of this trailer HERE and watch me ride 2500km across Japan with it HERE. Aevon STD 100 bike trailer. The STD 100 is the biggest and most heavy-duty Aevon trailer option. It can carry an additional 20 litres and 10 kilograms over the KIT L80 and still incorporates the shock for off-road use. With the STD 100, there’s also a more substantial side frame for additional drybag support. Aevon UNO 100 bike trailer. The UNO is the low-cost Aevon model designed for road-only use. The UNO omits the rear shock which generally isn’t necessary on smooth surfaces. This model will still carry the same 100 litre drybag as the STD. BOB bike trailers have got to be the most popular option for bicycle touring due to their relatively low cost and good build quality. The Ibex model employs a coil shock to reduce vibrations and make it more suitable for off-road use. All BOB trailers use axle mounts to make connecting and disconnecting a breeze. The BOB Yak is the most affordable model in the BOB trailer range. The side frames do a good job of supporting the big BOB drybag and up the back is a tight fitting fender to keep everything clean. Burley Coho XC bike trailer. Fresh from receiving a 2018 Eurobike Design Award, the Coho XC is one of the most versatile trailers in this list. For the off-road riders, the trailer will fit a fat 16 x 3.0″ wide rear tyre, and it has a coil rear shock which should help on the rougher trails. A handle at the front of the trailer has been built with a neat release button for removing the Coho quickly and easily from your bike’s rear axle. A feature uncommon on most single wheel trailers is the built-in double leg stand which is actually stable enough to hold your bike up too. In addition, the Coho XC ‘folds’; you can pack the trailer’s parts away into its cargo area without tools, which will be handy for those flying or storing their trailer in the garage. A long platform at the rear helps you stow objects longer than the cargo area (as shown in the picture). And finally, all rear axle sizes including quick release and 12mm can be accommodated, however, the trailer only comes with the quick release 9mm axle. It will fit on all rear end widths from 126mm (retro road bikes) through to 197mm (fat bikes). 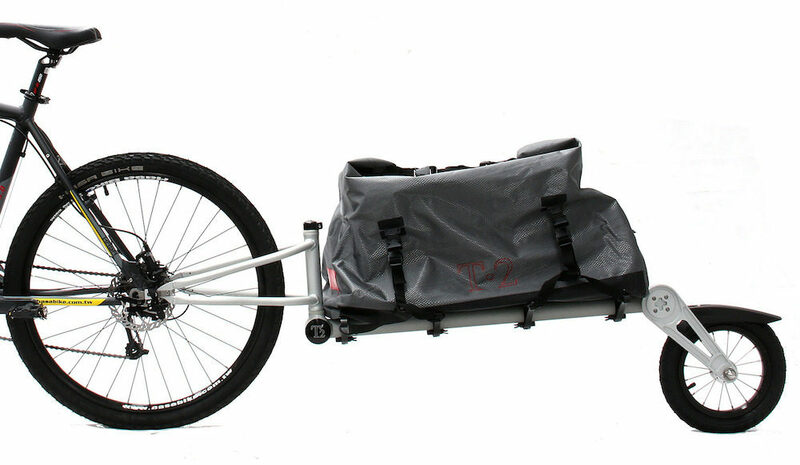 The Burley Nomad is one of the only two-wheel trailers on the list. The magic of this trailer is that it folds flat for travel, or alternatively you can remove the wheels and check-in the trailer as a separate piece of baggage. The Burley Nomad actually works out to be competitive in weight, price and still offers a huge carrying capacity. 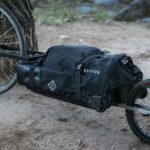 The Extrawheel trailer is unique in design as it creates a second rear rack for two additional panniers. It has a much larger wheel than most trailers which allows it to float over uneven terrain in a more efficient manner than many of the others listed here. The Extrawheels come in multiple wheel wheel sizes: 26″, 29″ or 700c. The USA-made FarFarer is a seatpost mounted option that’s ultra versatile given its seatpost mount and small turning circle. It uses a hammock-style bag to carry goods which unfortunately isn’t waterproof like the rest of the options. The most impressive feature is the ability to sling the trailer over your handlebars for technical sections of trail. The Free Parable T2 is the lightest trailer listed with the smallest fold and the smallest wheel (perhaps less suitable for off-road use). The T2 uses a series of ‘ribs’ under the 75 litre drybag to keep the bag stable and the weight down. 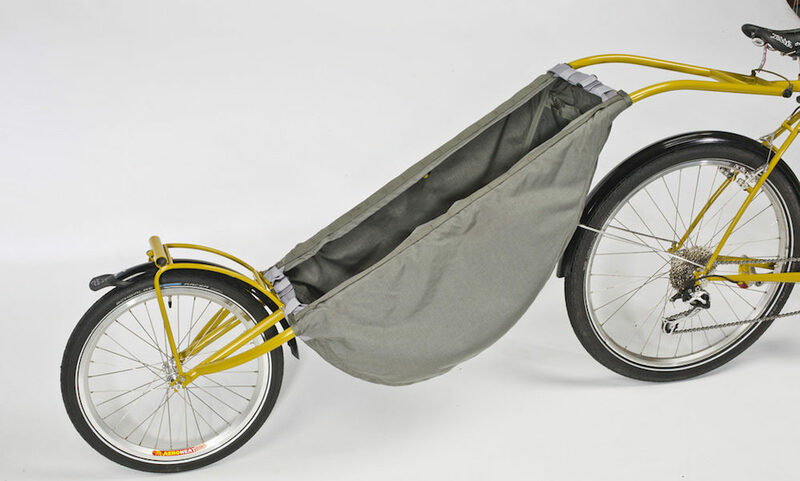 The Maya Cycle Bike Trailer is the cheapest trailer on this list. The construction quality isn’t quite to the same level of the other options, but from all reports it still does a great job. Unfortunately, it doesn’t use a drybag so you’ll need to ensure your gear is in waterproof bags. Radical Designs Cyclone IV bike trailer. The Radical Design Cyclone is the lightest two wheel trailer on this list. 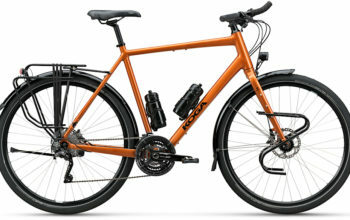 It uses better quality materials than the Burley Nomad, but this is of course reflected in the price. 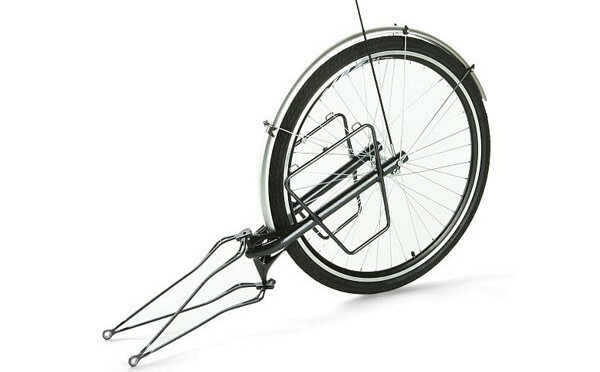 Like other two wheel designs, it folds flat and can be checked onto an aeroplane is baggage. A really nifty feature is that you can move the two wheels to a rear slot location (see pic) so that it’s portable off the bike. The bag isn’t waterproof, but the trailer is instead provided with a rain cover. 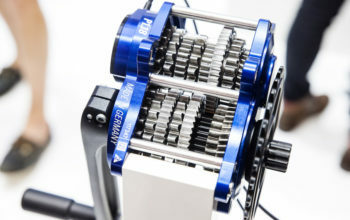 Renowned bike component manufacturer Topeak makes one of the only sub-5kg trailers. Using aluminium instead of steel, they’ve managed to shave off 15-30% when compared to similar designs. The Topeak drybag is designed specifically for the trailer, strapping in at multiple points along the frame. 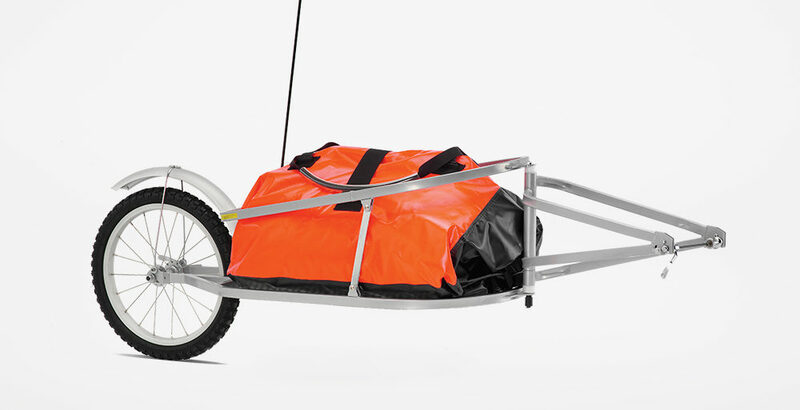 Tout Terrain Mule bike trailer. 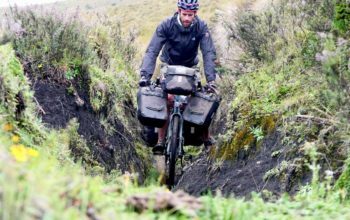 Tout Terrain may be famous for their touring bikes, but they also make a touring trailer called the Mule. The seatpost mount provides a tight turning circle and the air shock takes the edge off bumps on rough roads. The complete package is comparable in weight (and price) to the Aevon Kit L80. The Weber Monoporter is another trailer option that folds flat. Its name is derived from the fact that the wheel attaches from just a single side. This trailer works out to be quite lightweight too as it doesn’t use a side frame to stabilise the bag on the sides. 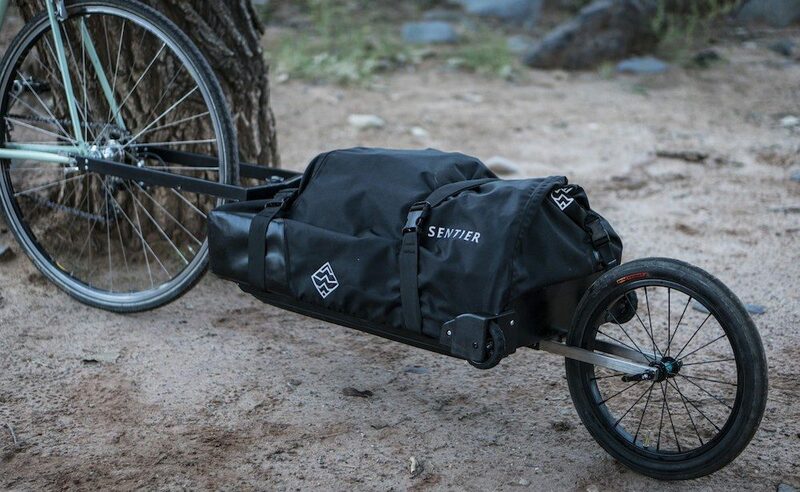 Sentier bike trailer / trolley. The soon to be released Sentier is the only convertible trailer/trolley option. Within 23 seconds you’re able to convert your trailer into a travel trolley and vise versa. 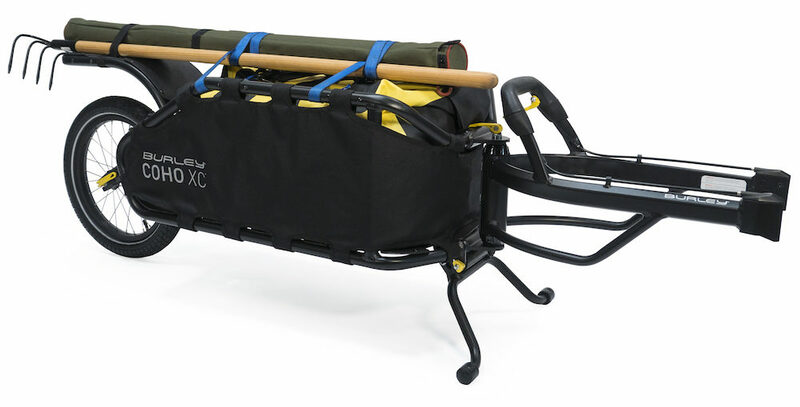 The only downside to this design is the additional weight; it works out to be about 25% heavier than a BOB trailer and drybag. Have You Had Any Experience With One Of These Trailers?